Just look at this beauty! Have you ever seen such a gorgeous girl. She is a very unique peach Torti and her personality matches her looks. Jupiter was definitely someone's inside cat, and she would love to continue that role. From her first day as a Purr Partners kitty, she made herself right at home with her foster mom. She is a tad bit chubby and needs some help in achieving her ideal weight, so weight control food and daily exercise sessions are a must. She loves to be in the same room and if you sit down she will be up on your lap in no time. She also would love it if she could share the bed with you at night! 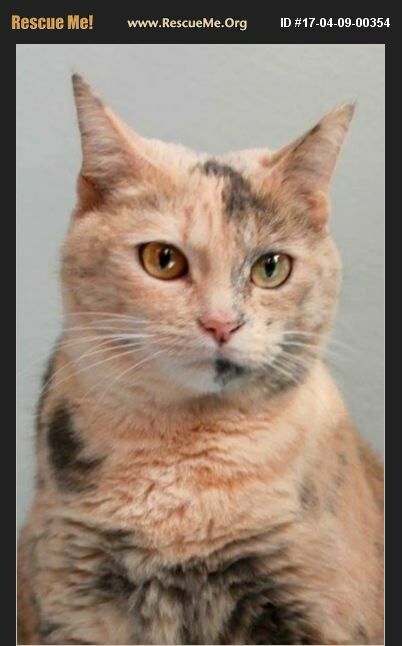 She will give you kisses and touch your face every so often just to make sure you are ok. She is good with other cats, dogs and although she doesn't live with kids now, her foster mom thinks she would be fine with them. She's a gentle and sweet girl. Won't you bring this pretty girl home and give her the forever home she deserves?